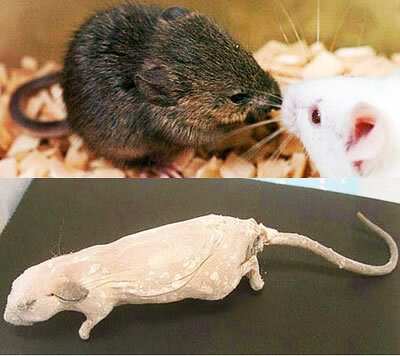 Researchers at Japan’s Institute of Physical and Chemical Research (RIKEN) have successfully cloned a mouse from carcasses kept frozen in permafrost-like conditions for sixteen years. However, the research team developed a technology to extract the nucleus of cell by grinding it softly in a special culture. Nuclei from brain and blood cells were taken from a mouse that had been frozen for 16 years at minus 20 C. The nuclei were then inserted into an ovum taken from a healthy mouse. Four mice were born as a result of growing cells derived from embryonic stem cells grown from the ovum and implanting the nuclei of these cells into the eggs of a surrogate mouse. Kinki University Prof. Akira Iritani--a proponent of a project to revive frozen mammoths--said: "It's believed about 10,000 mammoths are still buried in permafrost in Siberia. [This cloning research] might act as a fillip to the mammoth-revival project." The idea that long extinct animals could be "brought back to life" by scientific means was popularized by Michael Crichton in Jurassic Park. There is already an effort underway to try to bring wooly mammoths back - see 'Pleistocene Park' For Woolly Mammoths?. From Frozen tissue used in cloning; thanks to Adi for the tip and references for this story.